Here is my entry for this month’s Great Cakes Soapworks challenge. This is my attempt at a Clyde Slide. This was a hard technique for me. It took me several attempts to achieve the feathering which is the signature of this technique. I am pleased with my entry though in the end! I wanted to do something a bit different with my pour for this challenge. 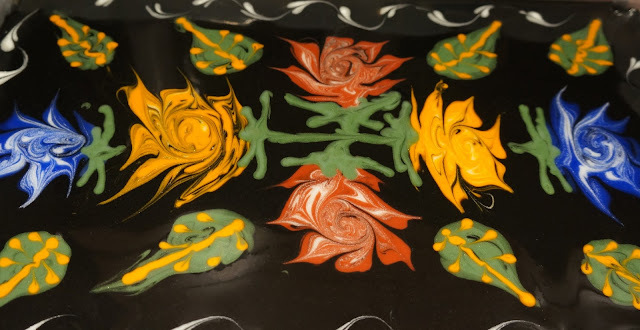 My aim was to pour the white base colour in at the back of the bowl and simultaneously pour the brown and green so they met in the middle. 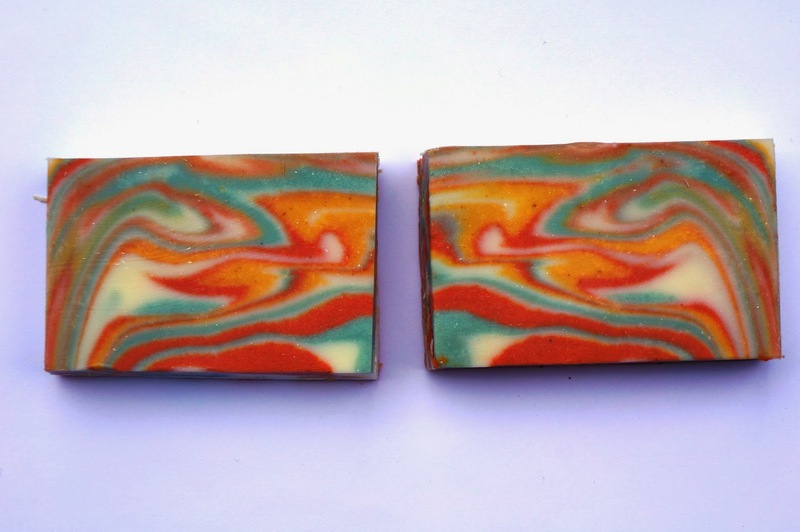 The aim was to produce a soap that had a different colour on each side rather than a homogeneous mix of colours, which I feel I managed to achieve. I quite like the symmetrical look that it creates. Here is a picture of the bowl as I poured. I used a washing up bowl to pour into as I found that using the regular jug that I make soap batter in didn’t seem to have a big enough surface area. 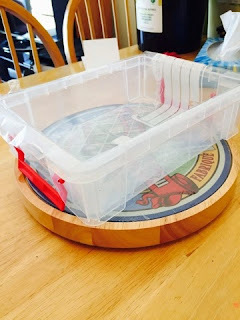 I was trying to find something similar to the big round bowl Clyde uses in his videos. I waited until I had reached a medium trace before pouring. 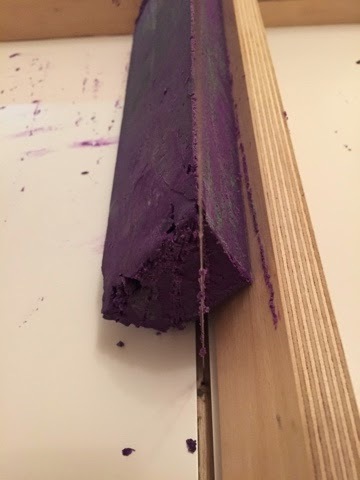 I propped the left hand end of the log mould up slightly by about an inch and poured in one solid sweep from left to right, then laid the mould back down flat. 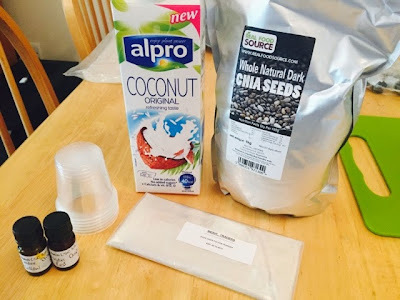 I chose a standard recipe with palm, olive, coconut and sunflower oils. 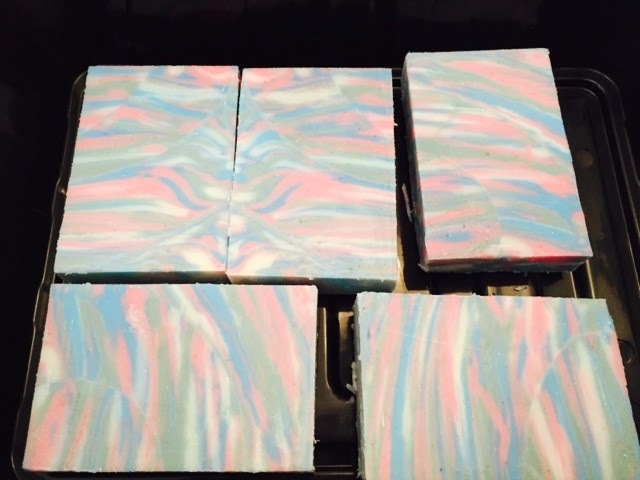 I have been thinking about making Christmas soaps recently which is why I chose the colour scheme, it reminds me of peppermint creams so I scented with a peppermint fragrance oil. I used brown and green mica from White Ape Pigments and titanium dioxide. I cut the top off one of the soaps to trim it down and it looks like there are some lovely feathers in the horizontal plane too. 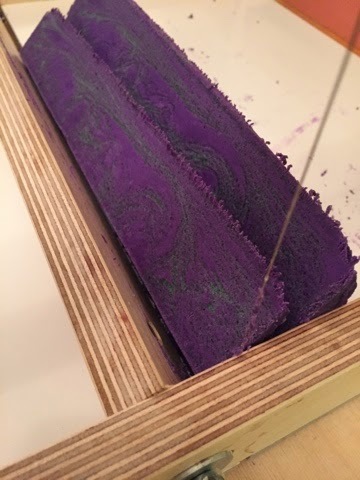 It might be cool to try cutting the soap that way next time instead to see what is revealed. I think the one on the right looks like an angel. I feel like I should write a separate blog post called ‘How not to do a Clyde slide’ as it took me quite a few attempts to get the technique to work how I wanted it to! Here is a run down of what I learnt the hard way if you are interested in reading it. Amy’s tutorial said that pouring the batter too thick would prevent the feathers from developing. I think I took this too literally with my first attempts. 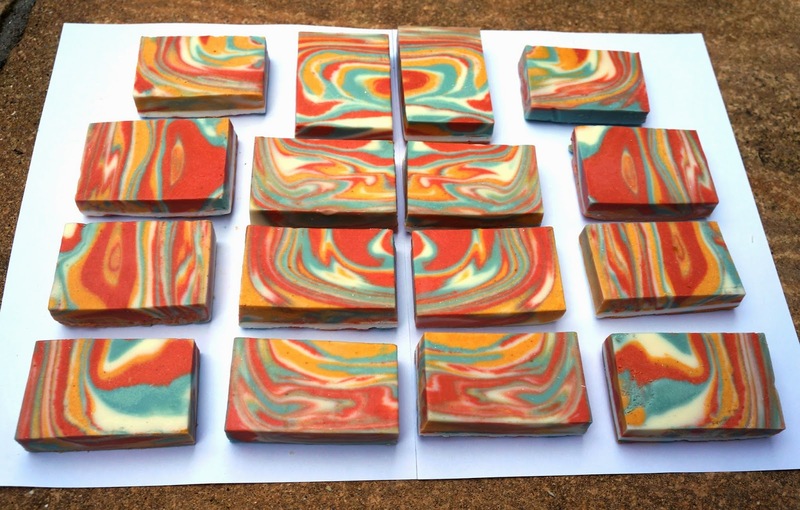 I poured them so thin that the autumn coloured soap which started out as several lovely shades of red, orange and yellow, turned into an unpleasant homogeneous brown. My second blue attempt was slightly thicker trace, but I still didn’t achieve any feathers. 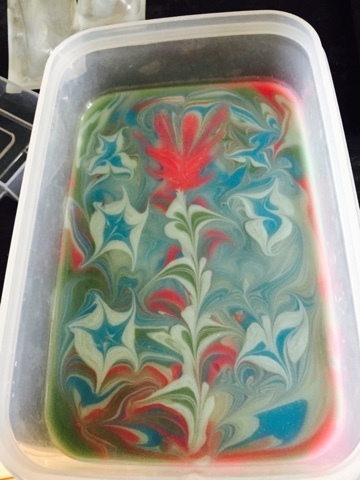 I think the soap still turned out fairly pretty though. I poured the grey base background, then poured pools of dark and light blue on alternative sides of the pot to try and achieve a soap which was half dark and half light, similar to my entry soap but in a jug. The soaps are really pretty and I like them a lot, but they don’t demonstrate the feathering at all. I think this was because the batter was too thin and the jug too cramped. 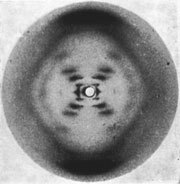 I think these bars look like they have smiley faces. I will definitely be using this technique again. I love the way it produces such different results each time, and I always seem to be able to see images and pictures in the bars. Thank you to Amy and Clyde for bringing us something really new and different to try. Here is my entry for this month’s Great Cakes Soapworks Challenge. 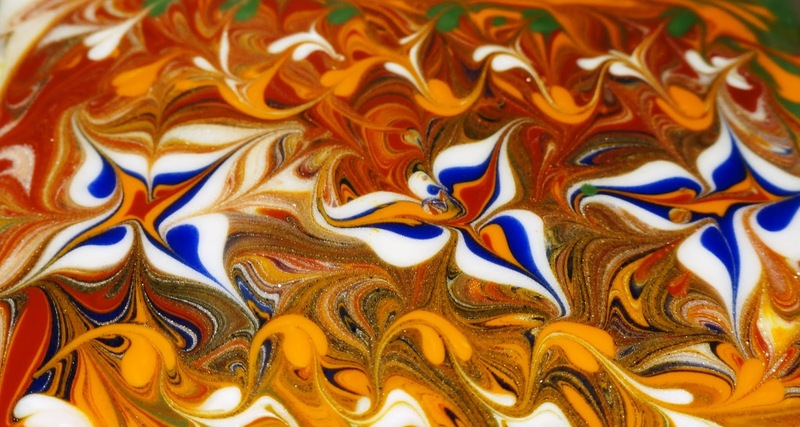 This month’s theme was ‘Ebru Art’. 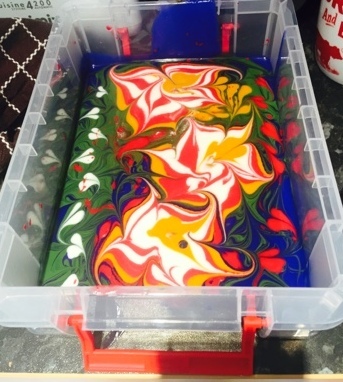 This is a turkish style of water marbling where dyes are floated on the top of a water gel base and manipulated to create beautiful designs. 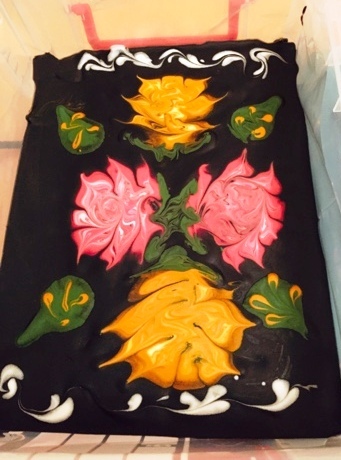 The main guidelines were to make sure your design had some form of ebru inspiration and that you only used a single skewer or tool to create your design. I had several attempts at this challenge and it was harder than I thought it would be. (I always seem to say that! My husband said ‘that’s why they are called challenges!’). 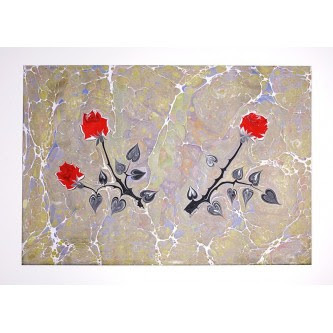 Most of the images of ebru art that I searched for were floral themed and I absolutely loved the roses that can be seen in the images below. 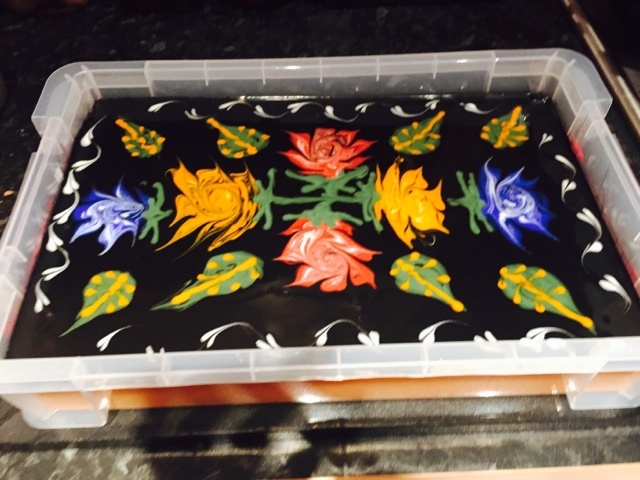 I didn’t just want to recreate an ebru design though. 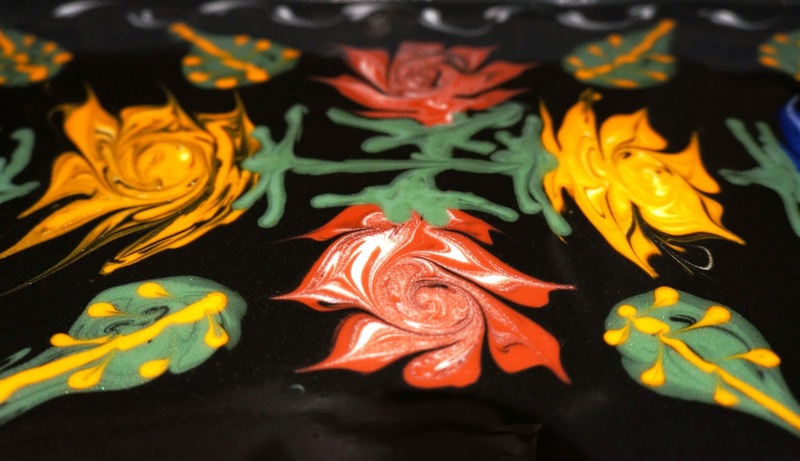 I wanted to put some of my own personality into the art so I chose to create ebru style roses with a ‘roses and castles’ twist. 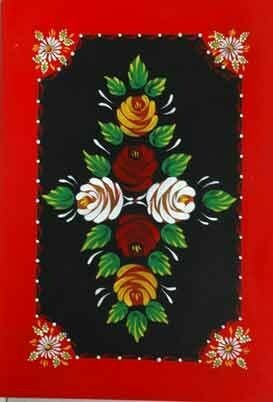 I grew up in the Worcestershire countryside where there are many canals and I absolutely love the ‘roses and castles’ style of artwork that is traditionally used to decorate the boats. As the name suggests roses and castles are often depicted in the artwork and bright vibrant primary colours are always used to create the designs. Below the example of ‘Roses and Castles’ art which I used to inspire my design. I wanted to fragrance my soap with a rose scent to match with my theme, but the only rose fragrance I have is very tricky to work with. 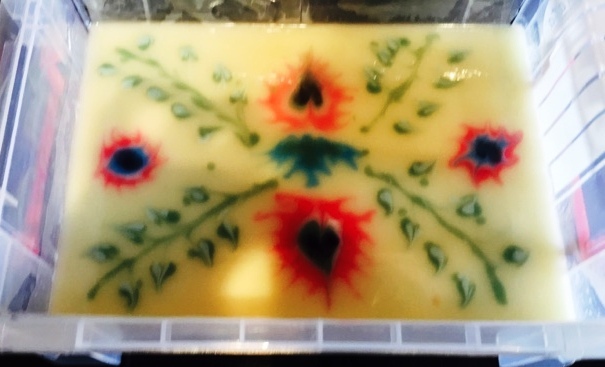 It rices badly, so I made the scented base soap first and added the unscented ebru layer afterwards. The base soap recipe was made with oils I had on hand. I used up some paprika infused sunflower oil to make the base so it was and orange/peach colour. The top layer was high in lard for a really slow trace. I had to work really quickly to mix up all the colours so that I had plenty of time to make my design. 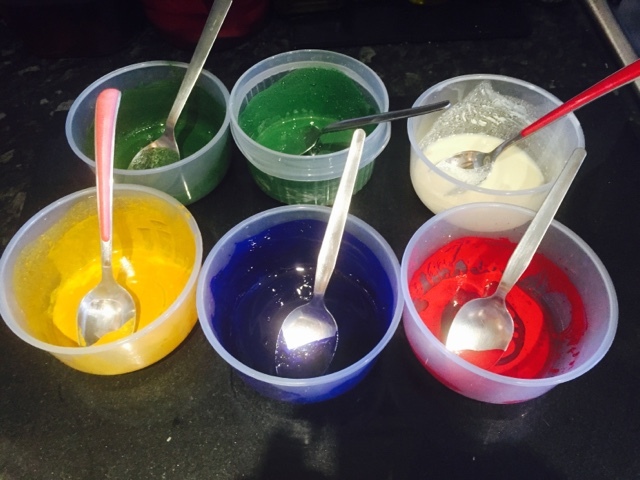 They were powdered mineral pigments and oxides with added liquid colourant for extra vibrancy so I mixed them in a small amount of glycerine to make sure they would mix into the batter with ease and the colour would be smooth and not clumpy. 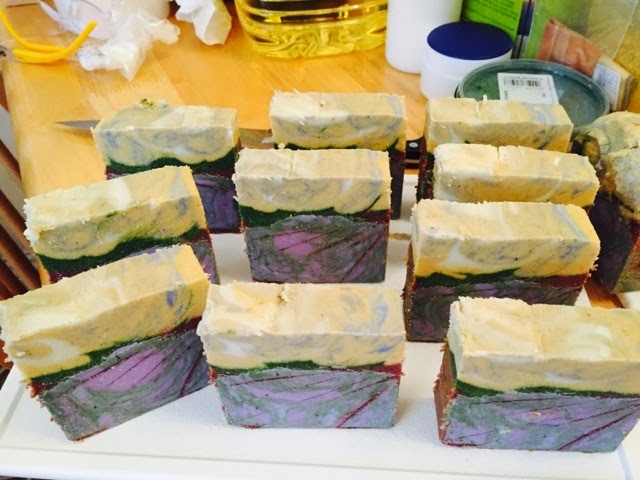 I poured the black top layer and then used squeeze bottles to apply the coloured soap batter to the surface. I then used a skewer to create the designs and added some finishing touches with the squeeze bottles. I don’t have any pictures of the process as I had to work really quickly to get the design done while the batter was still really fluid. I placed a lid onto the box after finishing the soap as I find that covering the soap really helps to prevent ash forming. 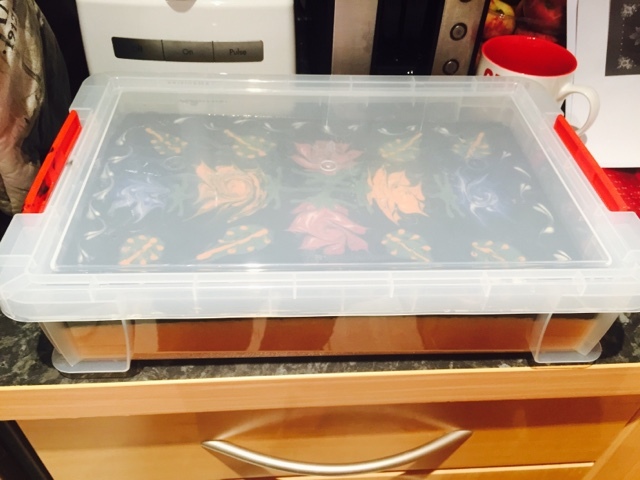 That is why I use lined plastic boxes as moulds as the clip on lids fit tightly and there is no chance of ruining the surface of the soap. Here are some of the other attempts I made for this challenge, there were quite a lot of them! This went wrong so I just messed it all around with a skewer. I still think it looks kind of cool though! Thanks again Amy for another great challenge. I am really excited to find out what the next three months challenges will be. This has been the hardest challenge for me yet. 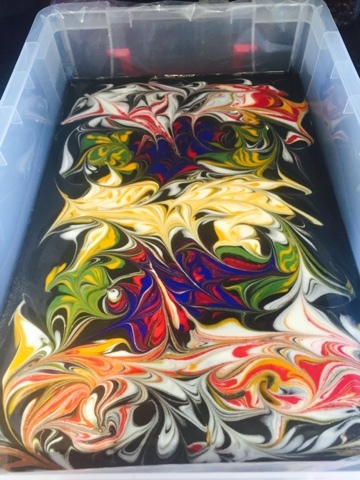 I have not made soap into dessert shapes, or used melt and pour before so it felt very daunting at the beginning. I was not short of ideas on what to make, but working out how to achieve them was the difficult part. 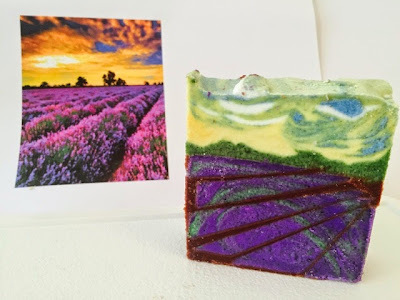 I know the main purpose of this challenge was to make soap art, so functionality was not as important, but it is difficult for me to think about making something that would not be used so I tried to make all my desserts as functional as possible. The first desserts I made were mini mango chia puddings. I have been eating a lot of chia at the moment so I already had some to use. 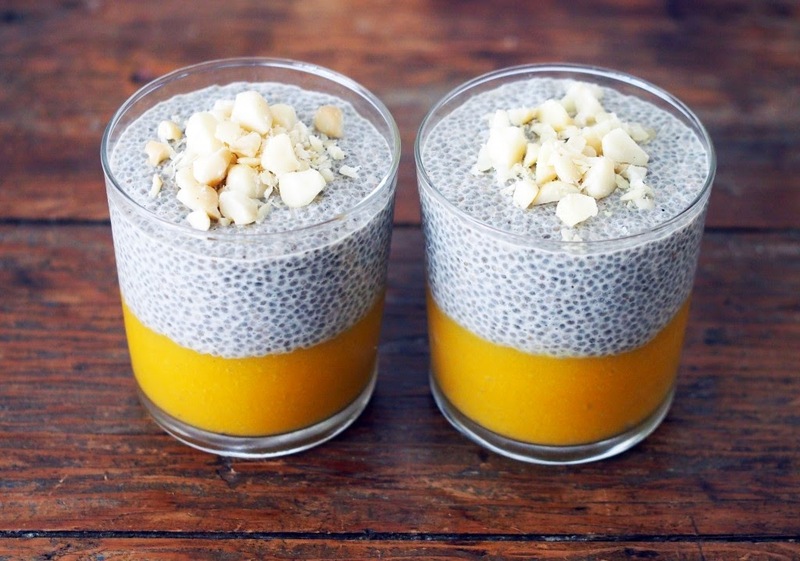 Chia has been becoming more popular at the moment in cosmetic products too. The texture of chia pudding on it’s own with surfactant added was not likely to hold it’s shape properly, so I decided to make it into a shower jelly. It has always been something I have wanted to try, but hadn’t got around to it yet so I thought this was the ideal opportunity. I started by making the mango coloured part. I used the recipe for 1% agar soap jelly found here. I used Sodium cocoyl isethionate as the surfactant as that is what I had available to me. 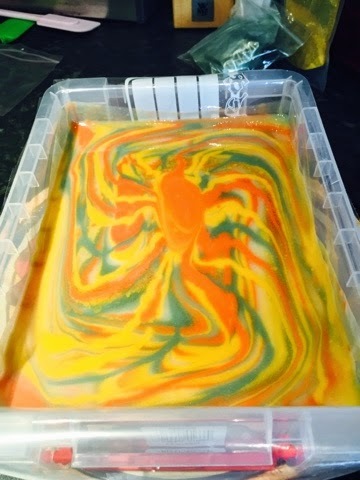 I coloured it with red and yellow liquid colourant until I reached a mango colour and poured it into some plastic shot glasses and allowed it to set. I unmoulded some of the set jelly and cut it into chunks to be used as mango chunks to decorate the top of the soap. Then I made another batch of jelly using coconut milk as the liquid and added about 2tbsp chia seeds. I poured it on top of the mango layers and allowed it to set. Before it had completely set, I added the mango coloured chunks to the top. I haven’t used these yet, but I am looking forward to it as I think the chia seeds will provide some gentle exfoliation. 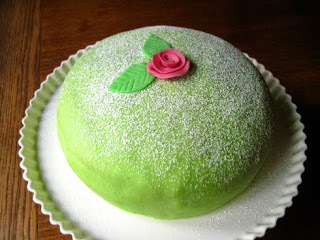 The second dessert is a Swedish Princess cake. 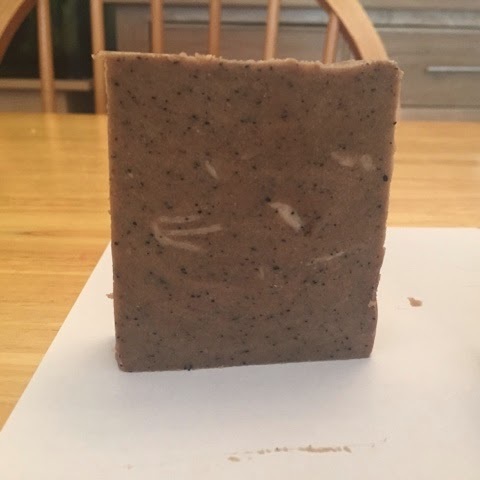 I made some cold process soap with powdered oats, milk and honey. The sugar in the milk and honey made it easier to mould into dome shaped balls and the oats made it the colour of a baked cake. 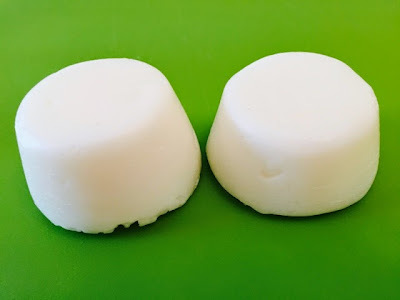 I then made some soap fondant using melt and pour, cornflour and glycerine, using the recipe given to us. 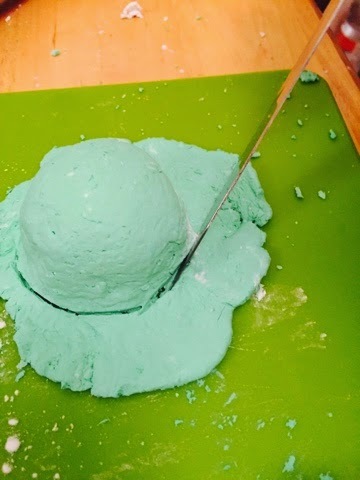 I dyed it green with liquid soap colourant to represent the icing on the cakes. I rolled it out and used it to cover the soap balls. This was not an easy task as the soap fondant isn’t quite the same texture as actual cake fondant. I then wrapped the base of the cakes with ribbon and secured it with a pin. I decorated the top with some sugar butterflies. Food ingredients – Espresso Coffee, Cocoa Powder. 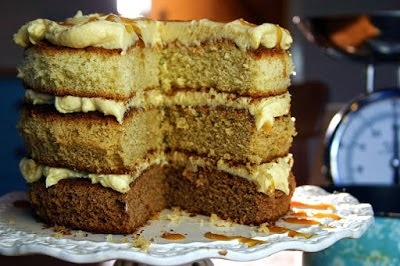 The third dessert is a naked coffee layer cake. 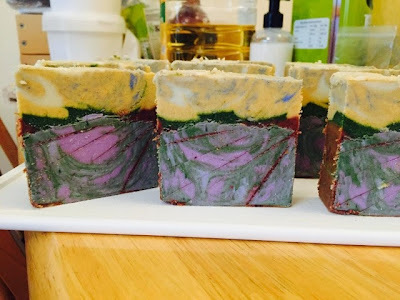 I made the soap layers from cold process soap. The brown layers are coffee soap with added coffee grounds and espresso added to the lye water. The white rounds are the same soap, but with the water content made up with water only and no coffee grounds added. 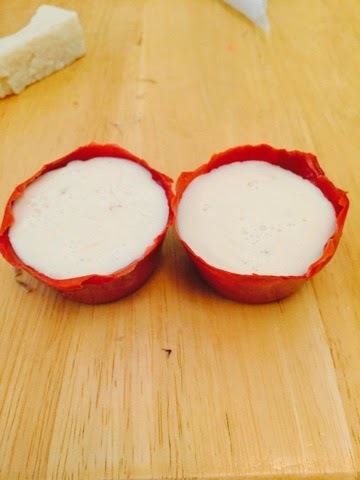 I didn’t have a mould the correct size so I made the soap in a log mould and used a metal cookie cutter to cut out the circular cake layers to the size and shape I required. The icing is made from foaming bath butter and melt and pour whipped together with cocoa powder added to give it the brown colour. I used it to stick the cake layers together and pipe the top. I used some soap curls of the coffee cold process top to decorate the top. Food Ingredients – Cocoa powder, beer. 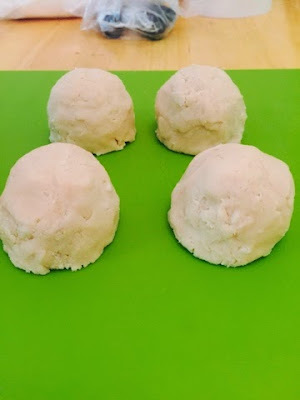 I made some more soft cold process soap with beer and cocoa powder added which I allowed to cure for a few days then rolled into balls in my hands until it was warm enough to mould into the bottom of a muffin pan lined with cling film. Once it had reached room temperature again, it was hard enough to hold it’s shape and the same consistency as a pie crust. I then used melt and pour for the first time. I only had clear base so I coloured it with titanium dioxide and a bit of cocoa powder and yellow iron oxide to achieve a creamy apple colour, I also coloured some more base with red iron oxide to represent the apple skin. 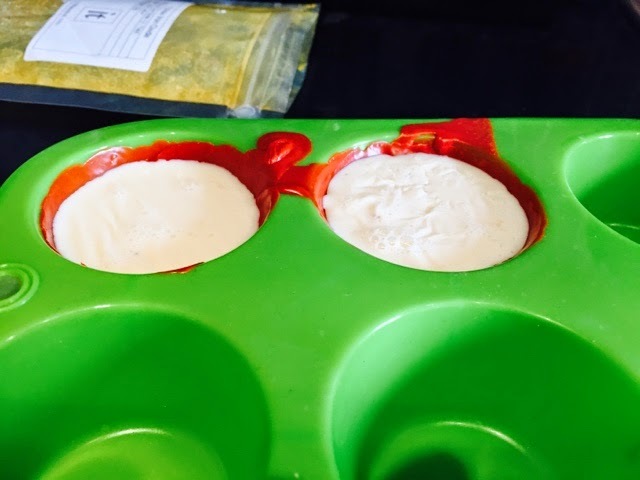 I poured the melted red soap into a silicone muffin mould and tilted it to coat the sides with the soap until it set. This meant there was a 3mm layer of soap on the inside of the muffin moulds. I then filled the insides with the cream melt and pour. Once it had set, I unmoulded it and used a cheese wire to cut it horizontally into slices. 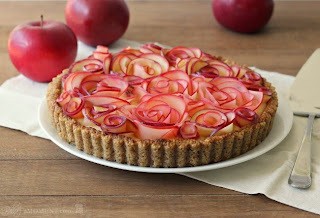 I cut each slice in half down the middle and was left with something that resembled apple slices with a small layer of red skin attached. 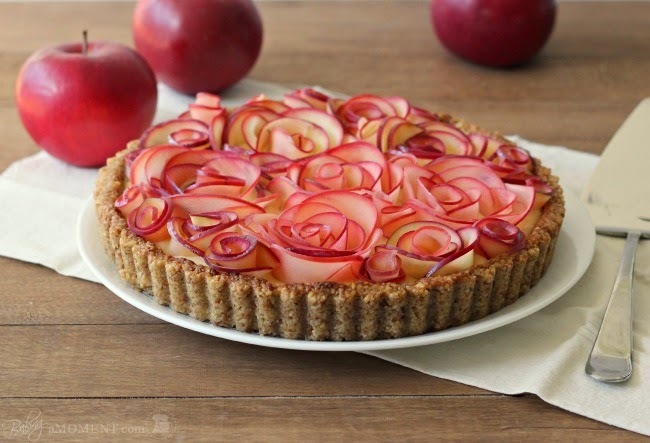 I curled these up into a rose shape and inserted them into the brown cocoa pie crusts, setting them in place with more of the cream melt and pour to represent the custard. Thanks again Amy and also thank you to Cee for showing us all these techniques. Another very challenging challenge, but I enjoyed being forced out of my cold process comfort zone for a change. I don’t think I will be using melt and pour again in the near future as I find it really fiddly and time consuming, and if I never have to see any soap fondant again it will be a day too soon! I now have an even greater admiration for those of you make these creations on a regular basis. I am really, really excited about next month’s ebru challenge. I can’t wait to get started! 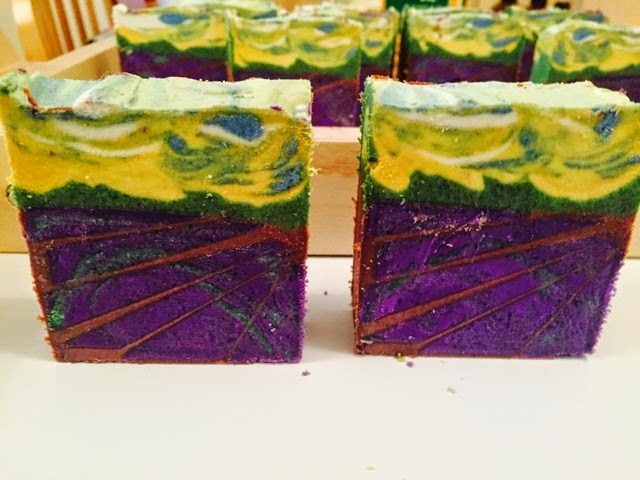 Here is my spin swirl entry for April’s Great Cakes Soapworks challenge. 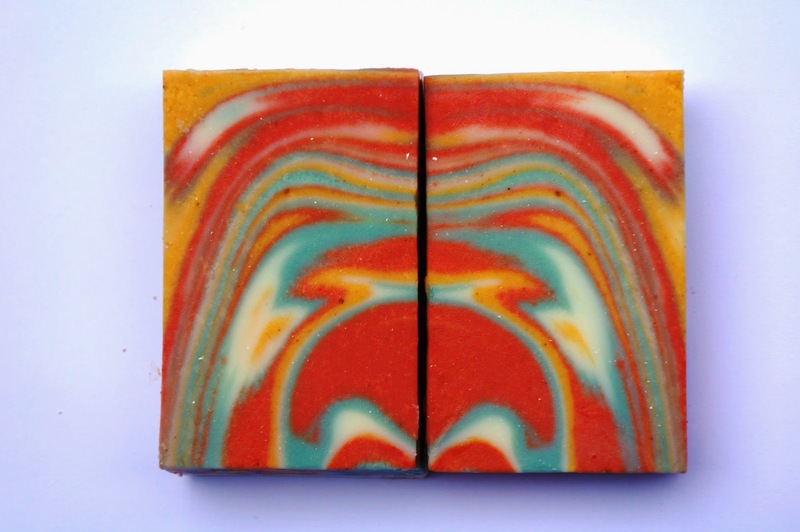 My entry is scented with orange, lime and patchouli essential oils to match the orange and green colouring. This was a hard one for me, I like to try to do something a bit different when it comes to the challenges and to think outside the box; but I was really short on ideas. I had three attempts, and have decided to enter my second attempt. I used a lard soap recipe as I find it traces fairly slowly. I coloured the layers with yellow iron oxide, dragon blood red mica (mixed with yellow to get orange) and olive green mica. I mixed up my powdered colourants with a dash of olive oil to make sure they would blend properly into the soap batter. (The last thing you want is loads of little spots where you have unblended colourant ruining your design). I only used a 3% superfat so the tiny amount of extra oil wouldn’t affect the final product. I decided to use a lazy susan to help me spin my soap as I thought it would be easier to control. 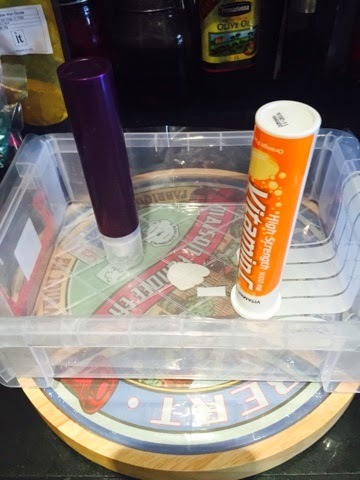 I glued the plastic soap mould onto the centre of the lazy susan with some blu tack to hold it in place. I didn’t want it to go flying mid spin! 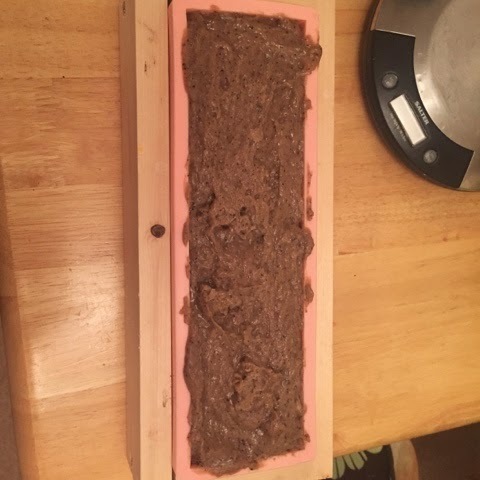 I also bought a small plastic tub to use as a mould as my big wooden log mould makes huge batches and the guidelines said we needed to be able to cut the soap in half to show the internal design so it had to be a double batch. I didn’t want to be overrun with millions of bars of soap! 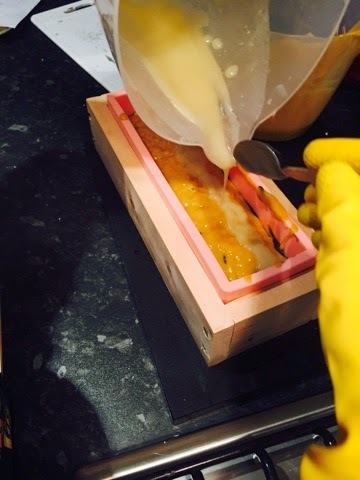 I decided to do a column pour to fill my mould so I used an empty vitamin C tube and a facial serum tube that were about the same size to pour the batter over. Then, when there was a small amount of batter left, I drew a star shape on the top with an orange blob in the middle to look like the sun. I wanted to see how much the straight lines would curve as I spun the mould. I then spun the mould. 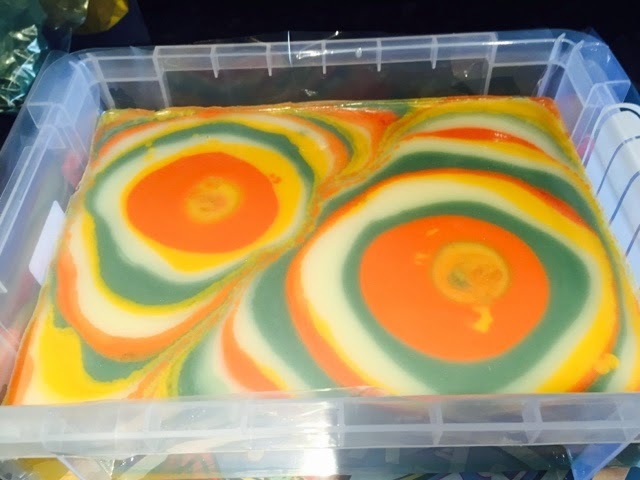 It is hard to tell whether you have spun it enough times as the top of the soap doesn’t move as much as the inside. It is a case of trial and error and fingers crossed that something looks nice inside. I am a control freak, so I find this very unnerving! I managed to succeed with only minimal splattering. I left the soap to harden for a few days before unmoulding and cutting. I was really pleased with the inside of this one compared to the others, I felt like I achieved a wide range of patterns across the slab. I especially like the one that looks like little flames, and the ones that look like tree knots. My first go at this was pretty dismal. I used grey as a background colour instead of white and had too much grey compared to the orange and green colours, so it looked drab. The swirls weren’t very well formed either so I won’t bother uploading pictures of those. I also had an attempt trying to ‘think outside the box’. I made some cardboard rings and inserted them into the soap batter after pouring the colours in stripes into the mould. The idea was that the card would guide the soap batter during spinning and turn the straight lines into concentric curves. It certainly looked different when I unmoulded and cut it, but I didn’t feel like it demonstrated the technique adequately. My original regular spin swirl had more life to it so that is the one I chose to enter. I think the key to getting nice swirls with this technique is to keep your batter very fluid, so you need to work very quickly once you have started and not over mix your colourants into the batter. As always the challenges push me to try new techniques that I wouldn’t otherwise have considered. Thank you Amy. I look forward to the challenge next month. 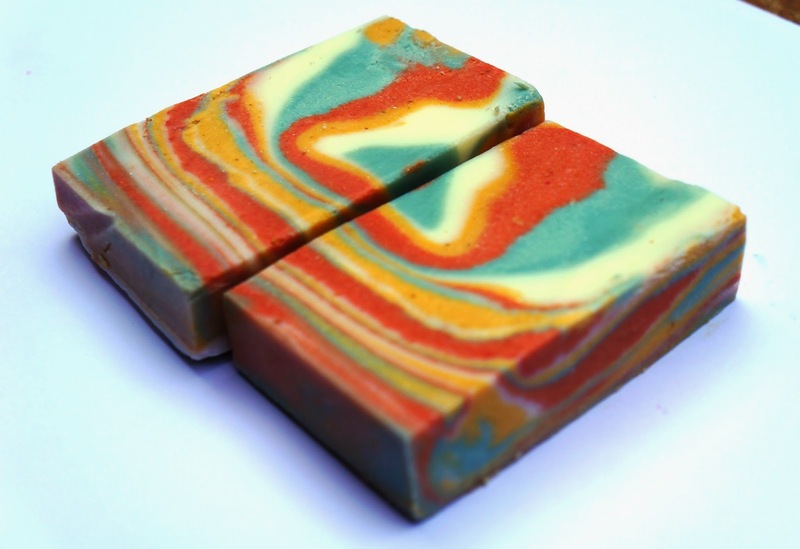 I made this soap for a swap over on the soap making forum. 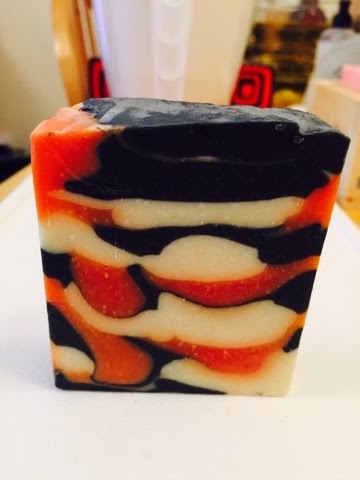 The brief was to use natural colourants to produce a soap, so I chose to use paprika infused olive oil and activated charcoal, with a bit of titanium dioxide (I know some people don’t like it but I have no problem using it). 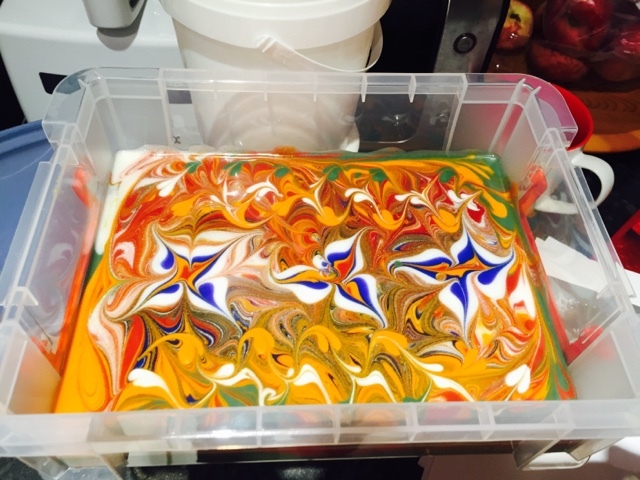 My aim was to pour a tiger stripe swirl, but while I was messing around mixing all the colours in it thickened up too much so it isn’t quite as stripey as I would have liked. I am still happy with the way it turned out though. I used 920g of oils for my recipe in soap calc as it fits in my 25x7x7cm silicone log mould. In order to use paprika infused olive oil to dye 1/3 of the batter I divided the total recipe into two parts. One part will be made from 1/3 of the total ingredients and one part with the remaining 2/3 of the ingredients. First prepare your paprika infusion. I put 150g of olive oil in a milk pan with 3tbsp of ground paprika and gently heated it on the stove for 10 minutes stirring occasionally. Then left it to cool and the paprika to settle in the bottom.I then poured the top layer of oil off leaving the paprika sediment in the bottom. 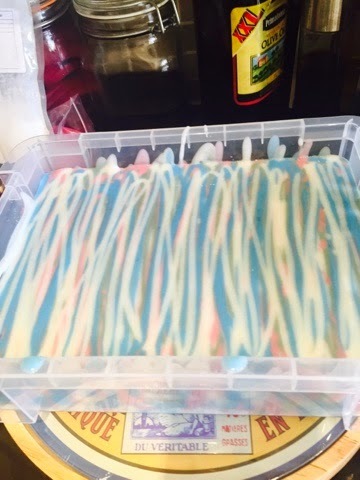 I used the top layer of oil to replace the plain olive oil in 1/3 of the soap batter. I then prepared two batches of lye solution and two batches of heated oils. I mixed up the two batches of soap batter as usual with a stick blender until I reached emulsion. 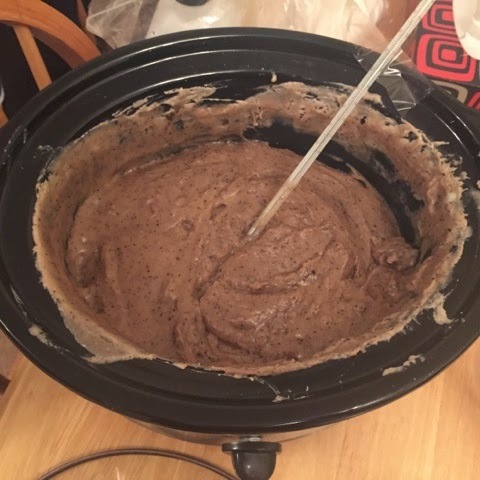 I then divided the uncoloured portion of batter into two parts and added 1tsp of activated charcoal to one part and 1/2tsp of titanium dioxide to the other part and mixed thoroughly. 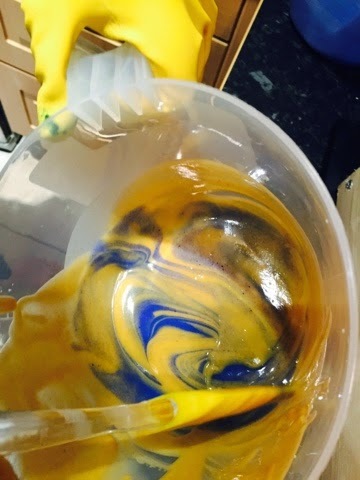 I then alternately poured each colour of batter down the centre of the mould on top of the previous layer to create a tiger swirl. (mine isn’t quite a tiger swirl as the batter thickened too much by the end and I had to glop it in instead of pour). You can see a good demonstration of the method here. 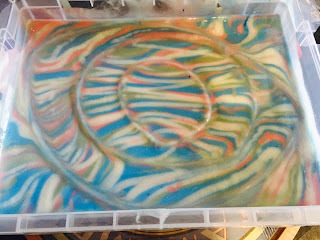 I hope I have given you some inspiration to give the tiger swirl a go and to try colouring with oil infusions. It really is very easy and gives you really pretty results. The challenge this month was to create a landscape in a log mould that didn’t contain any man made structures. This is quite difficult as many of the landscapes around me do contain man made structures. 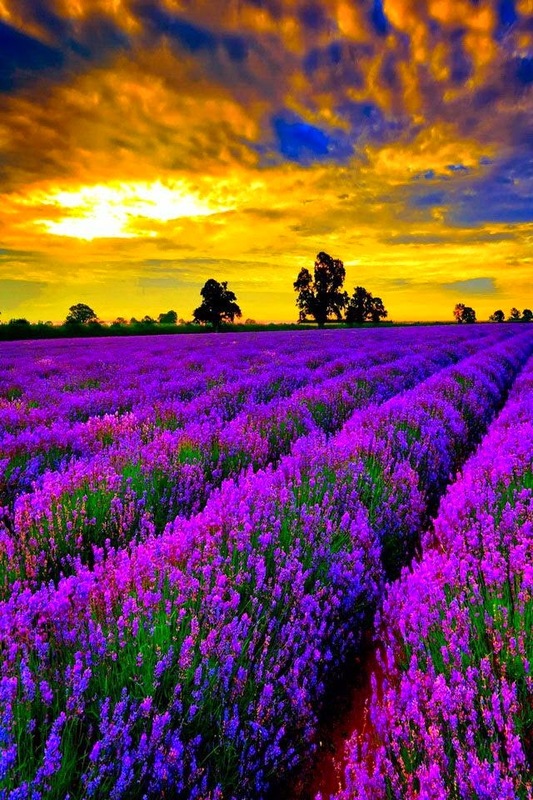 I decided to replicate this image of lavender fields as it is grown in Devon near to where I live. I also loved this photo as the vibrant purple from the lavender contrasts beautifully with the yellow and blue clouds in the skyline. I put this second picture up as it captures the yellow colour of the soaps better. 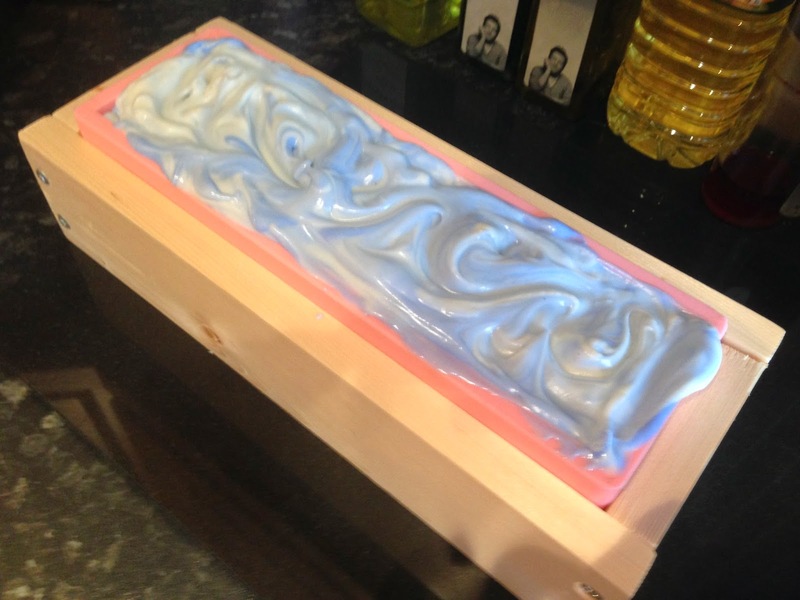 The soap recipe I used traces at a medium speed and creates a hard bar that can be unmoulded fairly easily. 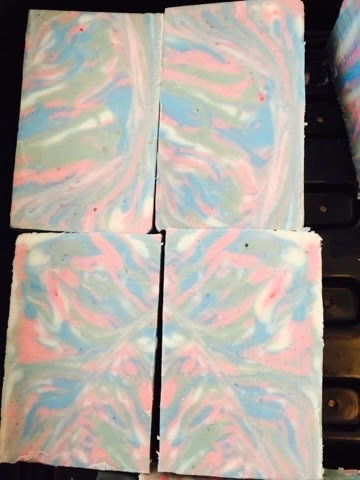 I scented the bars with 3% lavender EO as it matched my theme. 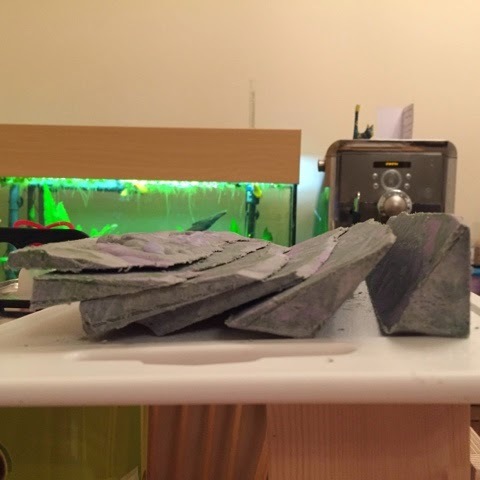 I started by making an in the pot swirl with a mixture of purple and green batter (liquid soap dye and spirulina) which half filled the mould. 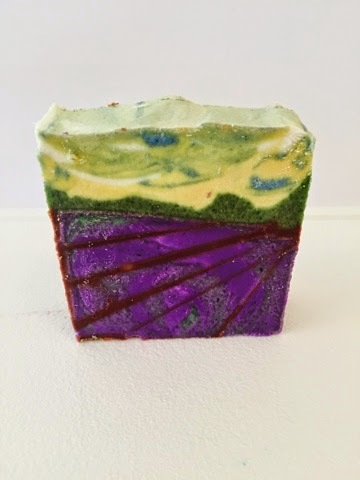 I allowed this to harden for a day, then removed it from the mould and sliced it into sections to represent the lines between the rows of lavender bushes. 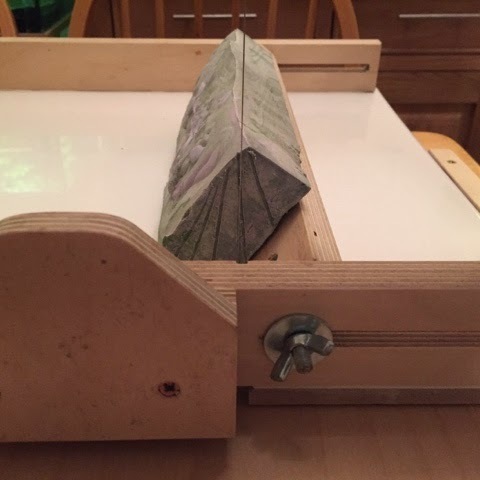 I used my soap loaf cutter from themouldsshop.co.uk to cut nice straight lines into my embeds. I would have really struggled without it! I then mixed up another batch of batter to fill the rest of the mould. I divided it into five different unequal parts to complete the design. One part brown for the soil between the lavender rows (cocoa powder), one part green (spirulina) for the tree line, one part yellow (liquid dye) for the horizon, one part blue (liquid dye) for the sky and one part white (plain batter) for the sun coming through the clouds. I had two attempts at this. The first attempt was made in a similar way, but I used mica to colour it. I wasn’t happy with the colour vibrancy and the brown lines in between the rows weren’t very distinct so I tried again with the liquid colourants. I had been looking to make a solid conditioner bar for a while. I thought it would last longer than a traditional bottle and allow me to control what I put on my hair. I have very fine flyayway hair and the silicones in commercial conditioner weigh it down, make it look dull and no matter how many times I wash it, I always look like I have greasy hair within a few hours. I wanted something that would still condition my hair adequately and stop it from looking frizzy, but without weighing it down and looking greasy. I did a lot of reading and found Susan at swift craft monkey to be extremely helpful. 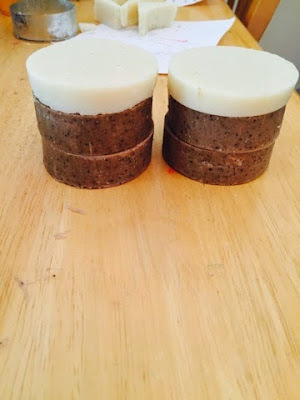 I used her post on solid conditioner bars to develop my own version, using ingredients I had available to me. I only made 200g as a trial batch as one of the main ingredients BTMS is pretty expensive. Melt the heated phase in a double boiler until it has only just all dissolved, (you don’t want it too hot or all your fragrance will boil off as soon as you add it). Then add the cool down phase and stir thoroughly. Spoon into mould, I used a silicone muffin tray as I find the shape fits nicely in my hands. I left them for 24hrs to dry out as Susan suggests and I was really pleased with the result. You only need to drag it over your hair a couple of times, then comb it through to the ends while you are in the shower. The bars last for much longer than a traditional cream conditioner too so even though the BTMS is quite expensive, it still makes the bars fairly cost effective. I find they work really well when combined with my cold process shampoo bar and a citric acid hair rinse. 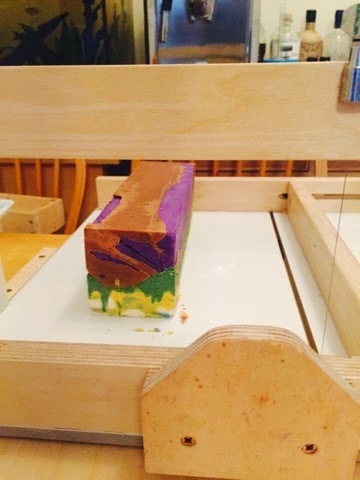 I had a lot of old scraps that needed using up so I decided to melt them down and rebatch them into more useful bars. 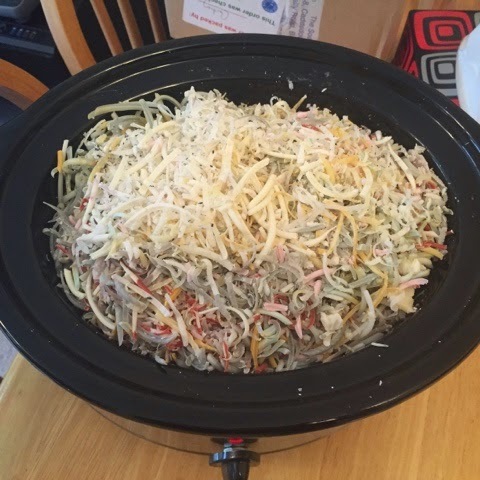 I took 950g of old soap scraps and grated them with a food processor. 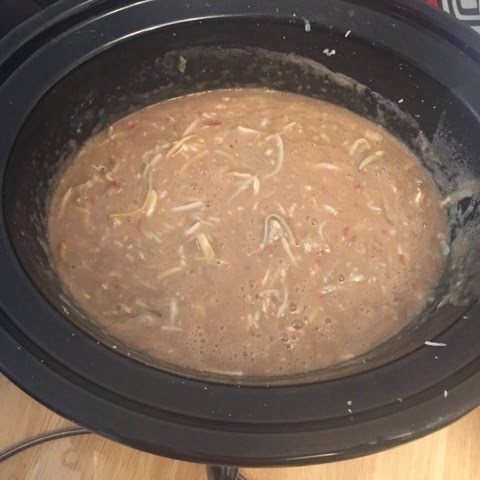 I then placed them in a crock pot on the high heat setting along with 500ml of freshly brewed coffee to turn the multi coloured scraps into a more attractive brown colour. I also added 27g sodium lactate, approx. 3% of the soap weight to make the soap smoother and easier to get into the mould. I boiled the soap mixture for several hours stirring occasionally to make sure it didn’t boil over. When the majority of the gratings had dissolved and the volume of the mixture had reduced to about a third, I added some fresh coffee grounds, about 2 tbsp and set the mixture aside to cool. When the temperature had dropped to below 45C, I added some new fragrance. The old fragrance from the scraps boiled off during the melting process. 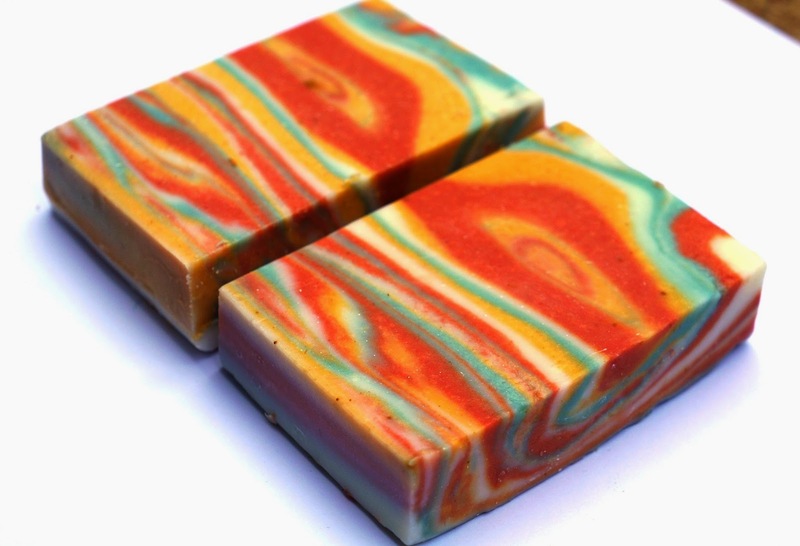 I re scented with a mixture of rosemary and patchouli at 3% of the original soap weight. I am quite pleased with the results, the bars look pretty smooth and they don’t look like a rebatch. I will leave them to cure for a couple of weeks before using them. I think next time I will use less sodium lactate, perhaps reduce it to 1.5%, as I think it will still be effective at a lower level. I recently discovered that Great Cakes Soapworks host a monthly soap challenge. There is a swirl technique that you are given instructions on how to achieve, then you are asked to take a photograph of your own personal attempt. All entrants are then asked to vote on which soap is their favourite. Unfortunately, my soap didn’t look the way I wanted it to when I did it completely in greyscale so I added in a touch of pale blue/green mica to add a bit of extra interest. I used a recipe that I have found to be really slow to trace. 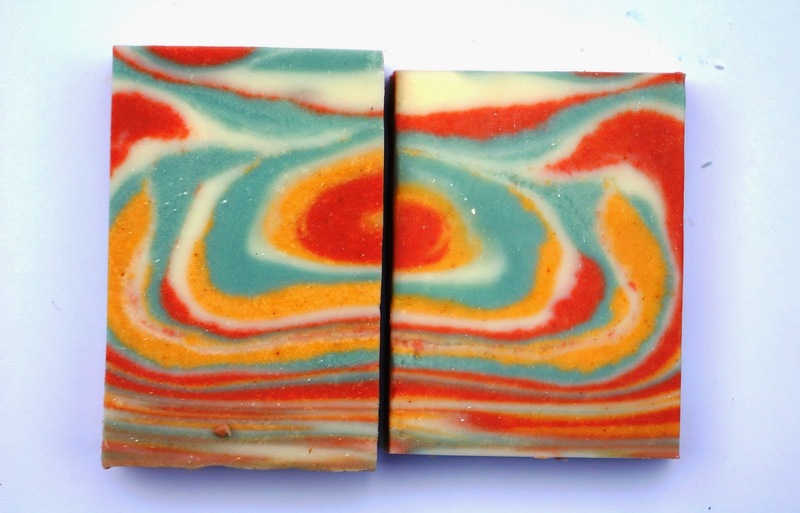 It takes days to set hard, and wouldn’t be my ideal choice for functional soap, but it allows you ages to work on swirls, and the bars are still useable. 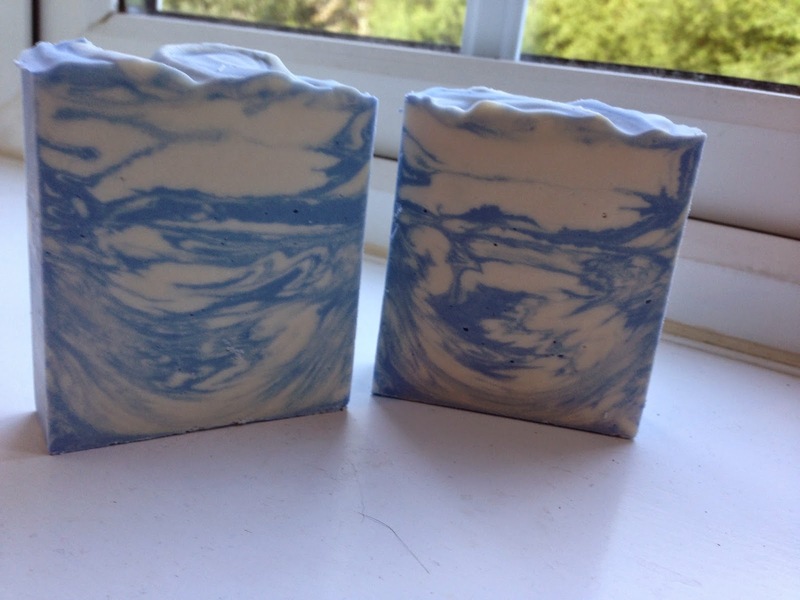 I scented with 3% English Rain Fragrance as I thought it went well with the blue and grey theme. I added titanium dioxide to the whole batch to create a white base. Then I poured about a 2cm layer of that base into the bottom of the mould. 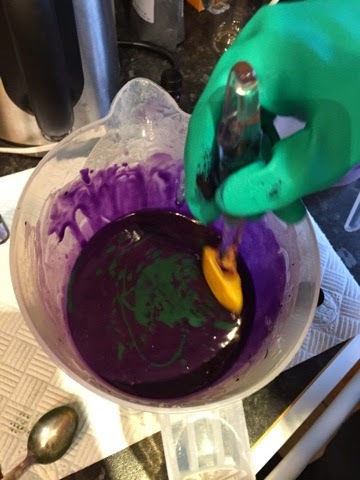 I poured the remainder into three squeeze bottles, and used two different concentrations of activated charcoal and blue/green mica to dye the batter. Here are some more close ups of my entry, a slightly different interpretation of the swirl, but I incorporated all the key elements so I hope it is acceptable and I hope you like it. 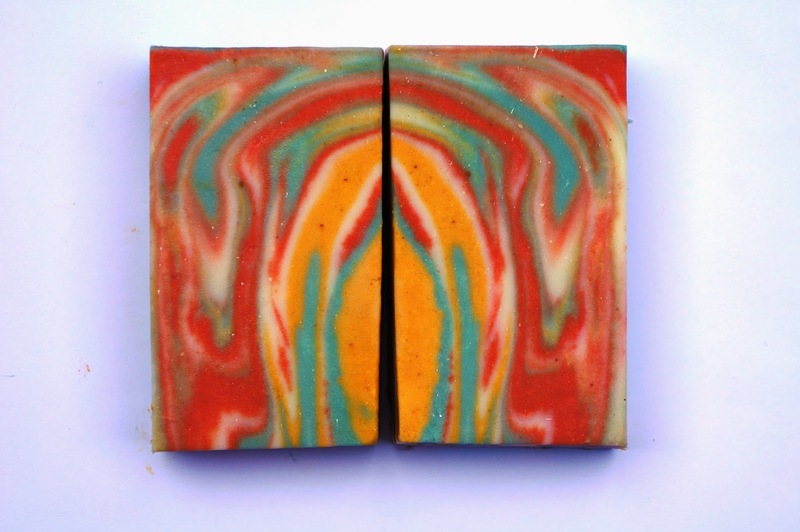 I will add some more images of the cut bars when the soap is hard enough to unmould. I decided to give it a try and I am really pleased with the results. I used a simple lard based soap recipe with a high coconut oil content of 30%. I usually only use a small amount of coconut oil in my soaps as I find it can be very harsh and drying, however salt is known to reduce lather so the increased coconut content should prevent having a non lathering soap. 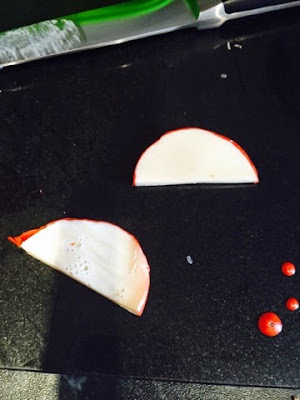 You can use any type of salt for this recipe, I used rock salt. Start by dissolving the salt into the lye water. Then add the sodium hydroxide, the mixture will become pure white and almost frothy (set aside to cool). Melt the oils until they have dissolved and allow to cool also. 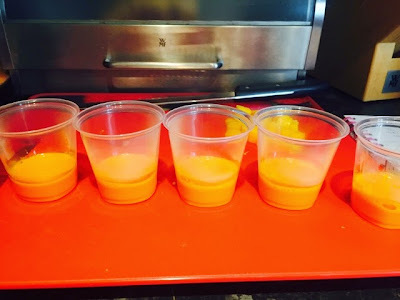 When both have dropped in temperature to below 35-40C mix together and stick blend until fully homogenised. 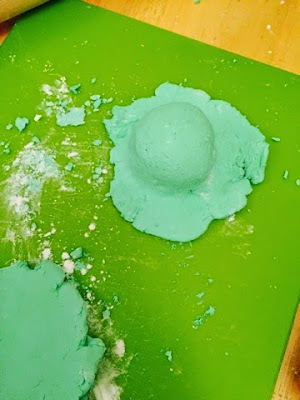 Add the titanium dioxide to all the soap batter and stick blend a little more to ensure it has fully mixed with no lumps. Divide the mixture into two unequal parts, 1/4 and 3/4 of the soap batter. Add the ultramarine to the pot containing 1/4 of the batter and mix thoroughly again. You will need to work fairly fast to ensure the soap batter does not set up too quickly. Pour the blue mix back into the white mix and mix gently with a spatula a couple of times. 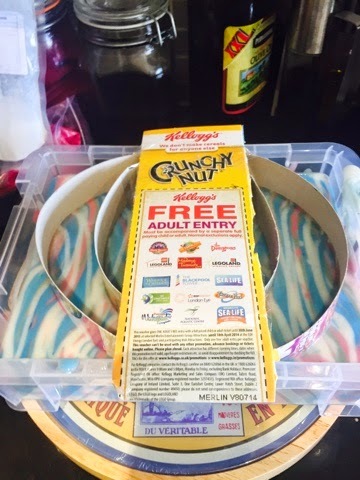 The same way you would fold ingredients into cake batter. Pour all the mixture into the mold and leave to set up. 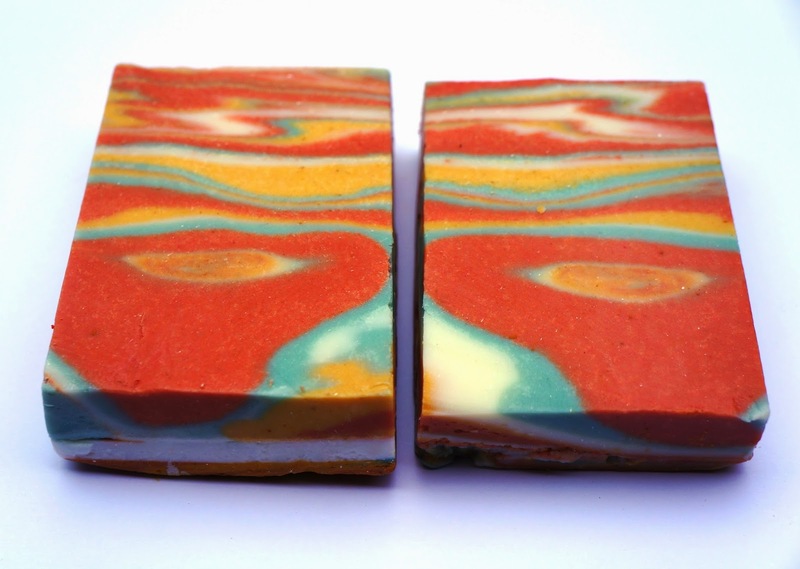 This soap will set up really quickly so you will need to unmold it and cut it within 4-6 hours or you will end up with a solid brick that is impossible to cut. Leave the soap to cure for at least 4 weeks before using it. 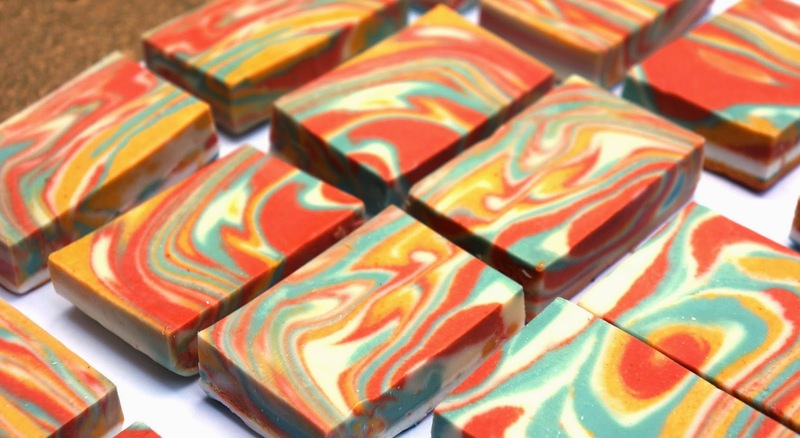 This is by far one of my favourite soap recipes so far. 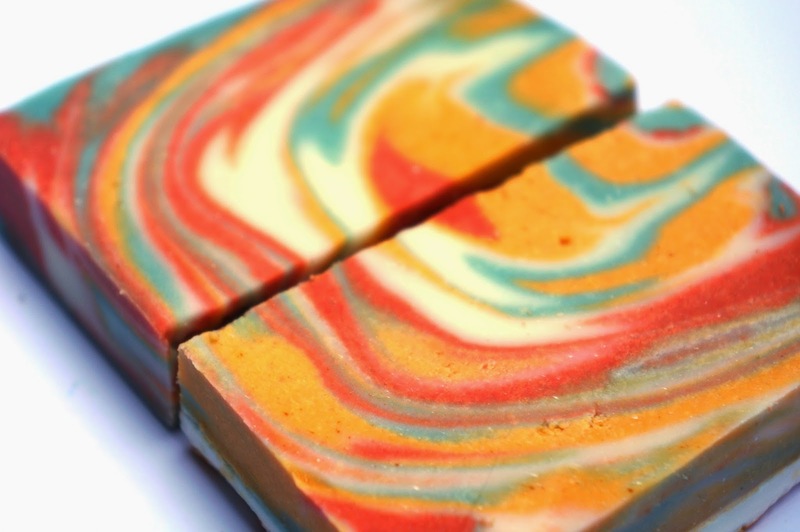 It makes a great shower bar as the soap is hard as rock and lasts forever. Give this a go, you won’t be sorry! 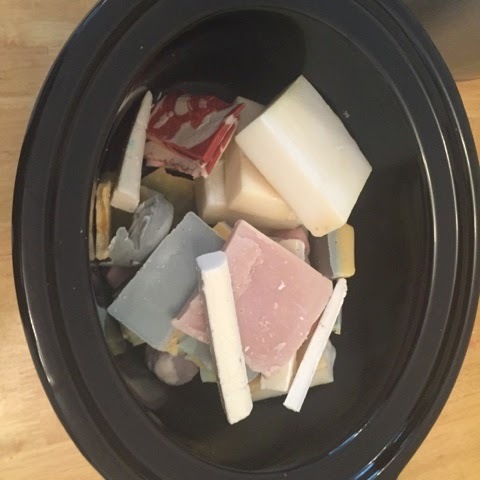 Has anyone else tried this method of making salt soap? How did your results turn out?